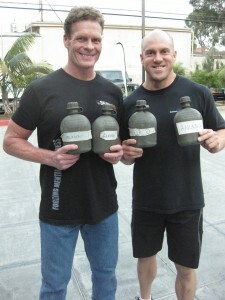 Mark Divine and Greg Amundson with the infamous Kokoro Camp #12 canteens. Mark Divine, the founder of SealFit and the Kokoro Camp, is coming to CrossFit Amundson on September 22, 2012, to teach the first Warrior Yoga and Unbeatable Mind Seminar. The one day Warrior Yoga Seminar is designed for professionals and athletes of any fitness level who are seeking to up their mental game and develop an Unbeatable Mind. Trainees experience increased focus, peace of mind, resiliency, mental toughness, calmness under pressure and presence as a result of putting the principle of this program to work in their daily lives. There are a very limited number of spots available in this Seminar. Please register in advance to secure your enrollment in the event. Greg: the labelling on those canteens does not look up to OCS standards! 🙂 Hope you’re doing well, man! I have many fond (though not easy) memories of being in your CrossFit sessions on those damned rice mats, lol.